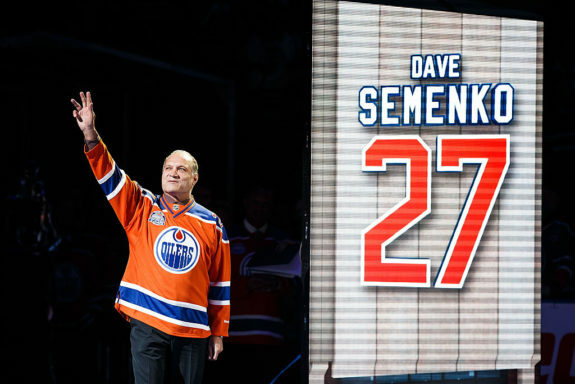 For a certain vintage of Edmonton Oilers fan, the name Dave Semenko has and always will hold a special place in their hearts. With that said, no one held the former second-round pick in higher regard than the men who played with him during his time in the Alberta capital. Not surprisingly, all of Oil Country was taken aback by Thursday morning’s stunning announcement of his sudden passing, after he lost his battle with cancer at the age of 59. Within minutes of the news being made the public the tributes started to pour in from former teammates via social media and a variety of other channels. While the devastated trio of Paul Coffey, Charlie Huddy, and Kevin Lowe were able to attend yesterday’s press conference at Rogers Place, others who were not so fortunate. Yet, that did not stop many from paying homage to their old pal. Wayne Gretzky, Mark Messier, Esa Tikkanen, Mike Krushelnyski and Craig Muni were among the first to let their feelings for Semenko be known and you can bet that number will grow in the coming days. Safe to say, the shock of the news left many inside the Oilers family searching for answers and reflecting on a player who was, by all accounts, one of the franchise’s most beloved players among those who have been lucky enough to wear the Orange and Blue. “Semenko was an amazing guy, he was a great teammate, a great friend, loved by the fans…in so many ways, said Lowe in an interview with Bob Stauffer during yesterday’s edition Oilers Now. “I really enjoyed my time with him…he always kept a smile on my face…through all the rough times and good times. We played together, worked together…off and on for 35 years. It’s tough to lose a friend…especially under these circumstance…he’ll be missed by many but especially by myself”. As much as fans focus on Semenko being one of the most feared and effective enforcers the NHL has ever seen, it is clear there was more to No. 27 than what he managed to get done when he dropped the mitts or decided to give an opponent that icy stare to quite things down. Clearly, all that was secondary to his teammates. If anything, it was his ability to keep guys loose with his sense of humour and being the man that he was that dwarfed everything else.